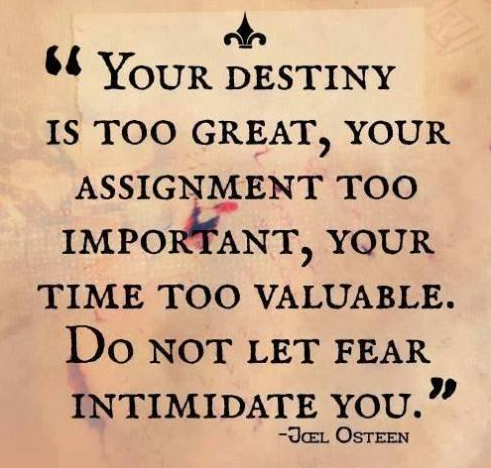 Your destiny is too great, your assignment too important, your time too valuable. Do not let fear intimidate you. Tell yourself: Everything will work out. Things will get better. You are important. You are worthy of great things. You are lovable. The time is now. This too, shall pass. You can be who you really are. The best is yet to come. You are strong. Life is filled with happiness, sadness, tears, smiles, laughter and other emotions but when life gets you down, just be strong about it and keep your head up high and have faith in all things in life. Always remember: God is at your side, always. Life is full of troubles, it's not gonna be so easy to fight but it's your life and you have to take the responsibility to fight for it. Be strong now because things will get better; it might be stormy now but it cant rain forever. Take a look at yourself, you're beautiful. Maybe you don't feel that way, but you are. 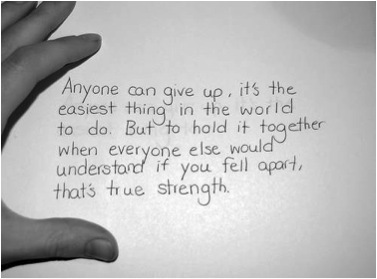 When things get tough, try to stick through it. It'll only make you stronger. In some circumstances of difficulty it is amazing to see how some succeed greatly when arising against a challenge while others seem to get discouraged and shut down completely in the face of adversity. Those who are able to succeed greatly in the face of stressful turmoil are those who are strong. Whether it be mental, physical, spiritual, or a good mix of all three, when someone has great strength it shows in the way that they handle themselves in different situations in their everyday lives. Being strong is a trait that takes time and effort to achieve, but with much hard work, dedication, and determination, being strong all around is definitely something that anyone is capable of. 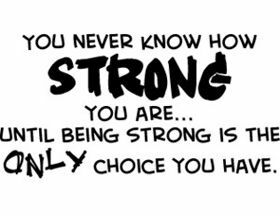 One main component of being strong is getting yourself to realize that periods of pain won’t last forever and that whatever situation you may be going through in your present, will only make you stronger in the future.